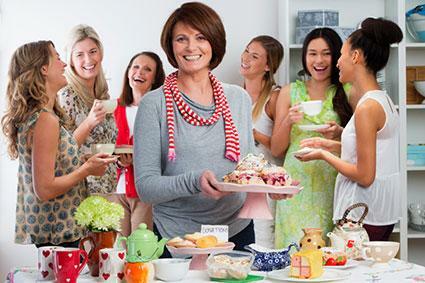 Hosting a tea party gives you the chance to organize an elegant affair for nearly any occasion. From the invitations to the decorations, these ideas will make your tea party the talk of the town. Custom-made invitations to the event get your guests excited from the minute the envelope arrives. The tea theme lends itself well to a variety of homemade party invitations. Let the guests sample your favorite flavor of tea before the party. A bag of seasonal or gourmet tea tucked into the envelope with the party details is a nice surprise for the guests. Decorative scrapbook paper works well as the base of teacup-shaped invitations. Create a template shaped like a teacup and use it to cut the decorative paper into cups. Add a piece of embroidery thread with a small paper square on the end to resemble the tab of a tea bag hanging out of the cup. The decorations set the tone for the tea party. These events typically maintain an elegant tone, using pastel colors and lace on the tables and walls. A decorative tea set is a staple on the party table. If children will attend the party, consider a set of plastic teacups for them. This allows them to still experience the tea party without the risk of damaged cups. A floral arrangement on the table adds to the elegant atmosphere of the tea party. The food and beverages play a central role in the tea party planning process. Consider the preferences of the guests at the party when planning your menu. The time of the party also influences the edible offerings. A tea party during mealtime should offer a more substantial menu, while an afternoon tea needs only light refreshments for the guests. Tea is an obvious option for the beverages at a tea party. Whether you choose tea bags or loose leaf tea is up to your personal preference. Consider offering a variety of tea flavors to please different taste preferences. It also gives guests the option to try a variety they may normally skip. Additional beverage options add variety to the menu. Lemonade, punch and water are suitable for the occasion, particularly if the guest list includes children. Iced tea offers an alternative to the guests during warm weather. Tea sandwiches are the traditional offering of tea parties. These small sandwiches are elegant and versatile, allowing for many different types of fillings. Chicken salad or cucumber sandwiches stick with tradition, while fun combinations such as peanut butter and bananas appeal to younger tea party guests. Crackers, cheese or salads round out the menu if you want to add more substance. The great thing about hosting a tea party is the menu is up to you. Feel like breaking from tradition? Surprise your guests with your favorite foods or serve a variety of appetizers. A sweet finish to the tea party leaves your guests smiling. Cupcakes, petit fours, sugar cookies or tarts allow for pretty presentations and satisfy the sweet tooth of all guests. Place the desserts on a pretty serving stand, or place a dessert by each place setting on a matching plate. Prepare your food well in advance so you aren't rushing around at the last minute. Put the food on decorative serving trays before the guests arrive. Set the table, including the decorations and place settings, at least an hour before the guests arrive. Have a small activity or snack to keep the guests entertained while you wait for everyone to arrive. Determine a schedule for your tea party activities so you can keep things moving, but don't worry if you get off track. When it comes to hosting a tea party, the important elements are planning ahead and having fun. Whether you go the traditional route or stir things up with creative elements to your tea party, don't forget to sit back and sip your own cup of tea with your friends.